My search for a healthy skin care alternative began in 2010, when my sensitive skin could no longer tolerate commercial creams and lotions. Maybe it was the petroleum products, perhaps the alcohol, something in the fragrance or dyes, I couldn’t say. But I knew I needed something to protect and heal my skin from all my time spent outside digging in the dirt or inside frequently washing my hands and cooking utensils. My livelihood, let alone my personal comfort, rested on finding a product that I felt good about putting on my skin and my skin felt good about – period. The first product I really needed was a burn balm. I’m a chef, and no matter how careful I am in the kitchen, I can’t avoid the occasional hot pot. For hundreds of years, people across the globe have made their own health treatments. Through experimentation we have unlocked the power of botanicals. This is kitchen science. I began experimenting with ingredients known for healing skin such as African shea butter, aloe vera, and calendula oil. However, as a chef, I understand that even simple ingredients need a bit of enhancement. Think of berries with just a bit of sugar to heighten sweetness or a pinch of salt on a garden tomato. The right combination of ingredients, even for a lotion, can be transformative. And personally, I like lotions with particular textures and soothing fragrances. I began researching ingredients often just wandering through my garden seeking out fragrances that I liked and testing herbs with known therapeutic properties. The process was slow, much in the same way it is when I develop recipes. But when it’s good, it’s really good. I shared the first batches with family and friends and I quickly knew from the calls and request for refills that my ideas about quality ingredients held true for everything in my life. 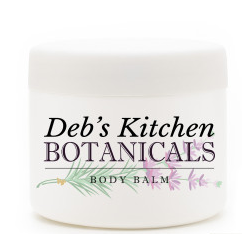 Deb’s Kitchen Botanicals was born. I believe strongly in the earth-health connection. What goes into the soil eventually ends up in our bodies. That’s why I practice sustainable gardening, cook with organic and local ingredients, and use natural cleaners. It followed that the care I was taking in how I was feeding my insides should also go into the ingredients I was using on my skin. 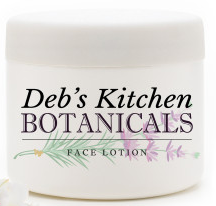 Deb’s Kitchen Botanicals are made with organic and natural ingredients that are both preservative and chemical free.